A small sampling of the most unusual foods from Asia. Warning: may not be for the faint of heart or stomach. Also known in Southeast Asia as "King of Fruits," if you consider a foul stench kingly. The smell is so penetrating, it sticks to your clothes and hands, even through the thorny husk. But the fruit itself is sweet and creamy, if you can get past the smell. Natto are fermented soybeans notorious for their pungent smell, which have been compared to dirty old socks, but they're still tame compared to the durian. They're commonly slurped in Japan for breakfast with rice. Boiling powdered turtle shell with herbs and letting it evaporate will bring you turtle jelly, first made as a medicine in China meant to, as this website describes it, "up your yin and down your yang." 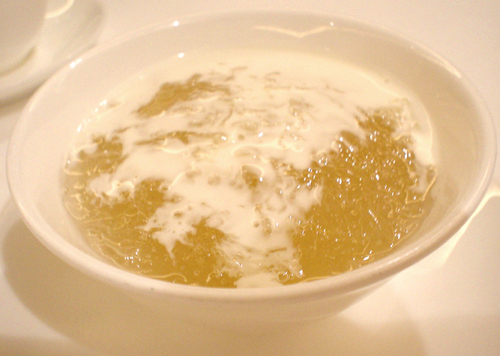 Quite right as the bitter jelly is balanced by either honey or condensed milk. In Indonesia, the coffee berries eaten and excreted by the Asian palm civet are used to make coffee. Yup, coffee from civet poop. It's sold for a high price which has led to caged civets being force fed the berries by greedy farmers. But it's largely a novelty item; connoisseurs agree it tastes terrible. Chicken feet aren't eaten only in Asia, but in Peru, Mexico, and South Africa too. Sure it’s just chicken, but it’s all marinated skin and chewy tendons. So let’s call it a textural experience. This soup is literally cooked bird spit. Swiftlets use their own gummy saliva that hardens to build their nests. A single nest can cost up to $100 but all that calcium, iron, potassium, and magnesium value must be worth it. This Filipino delicacy is a fertilized duck egg boiled alive and eaten in the shell. I've tried it and it's not half bad, but it was a little sad eating the unassuming baby duck. If balut is too fresh for you, try the century egg from China. It's duck or quail eggs preserved in a saline solution for months. This apparently gives it a weird creamy-jelly texture and tastes just like regular egg, so like why? But like, OK. If saliva isn’t your thing, try this clotted chicken blood from the Philippines. Grilled and skewered for cheap, the local name is “betamax,” after the archaic black and box VHS tapes Sony made in the 70’s. In Okinawa, Japanese winemakers submerge snakes in the jars of sake and let them drown, releasing their venom into the wine to create a special drink that enhances the male libido. A "pants snake" joke is just too easy. White ant eggs are a popular delicacy in Southeast Asia and they're often prepped in soups, along with partial embryos and baby ants. Almost caviar-esque, they pop in your mouth to release a sour flavor. If you like honey, then maybe you'll like honey bee larvae! They're cooked and seasoned, but the crunch of the exoskeleton and the chewiness of the innards might be hard to get past. Beondegi literally means "chrysalis" or "pupa" in Korean, particularly that of silkworms. They're steamed or boiled, then seasoned for sale by street vendors. Goes great with beer and lots of it. So insects are apparently delicious at all stages of development. These Japanese crickets and grasshoppers are seasoned and cooked with sugar and soy sauce, adding a savory crunch to a bowl of rice. Another innovation from Japan, where hunters catch digger wasps in forests, boil them in water, dry them, then throw them into the cracker mix because PROTEIN! During the Khmer Rouge rule in Cambodia, people began frying tarantulas when food was scarce. Now it's a foodie attraction, described as "a cross between chicken and cod." Not bad for a spider. They've done raw fish in Japan, so why not raw horse meat? Also known as cherry blossom meat, it's low in calories, fat, and cholesterol, and very high in protein. Maybe we should go for lean horse meat instead! One of the more famous weird foods, fugu is the Japanese pufferfish, filled with a very lethal toxin. Prepared properly, it's a pretty safe and bland fish, but it's more about spitting in death's face than the actual taste. Shirako translates to "white children" from Japanese and it's — you guessed it — the male fish's sperm sac. Because if fish eggs are fair game, why not fish sperm? The Japanese really make use of every part of an animal, and tuna eyes are pretty tame, tasting like fatty boiled squid. It's really just the fact that your plate is staring at you that can be unnerving. As for the rest of the fish, it'll be used for shiokara. It's a Japanese stew of minced seafood in a paste of their own innards. It's a lot to handle; the Japanese gulp a serving in one go and chase it with whiskey. So that's one way to pre-game. That's right, these shrimp are still alive and swimming drunk in a pool of alcohol. You bite off the head to kill it and pop the still wriggling body into your mouth. Yet another way to pre-game. To be fair, they're not alive, but the nerves in these octopus limbs aren't going to give up. Tentacles have been known to put up a fight before going down the hatch. But hey, at least you know they're fresh.